Fourth-grader Stanley Nudelman is about as wimpy as they come—he's cowardly, shy, and spends most of his time hiding from the school bully, Knuckles Bruzkowski! Then Stanley stumbles upon the yard sale of his neighbor, Old Lady Imavitch, where he buys a mysterious stuffed animal. But this isn't any old toy . . . it's Zombiekins! He's a little bit teddy, a little bit bunny, and a whole lotta ZOMBIE! And he's coming this way! 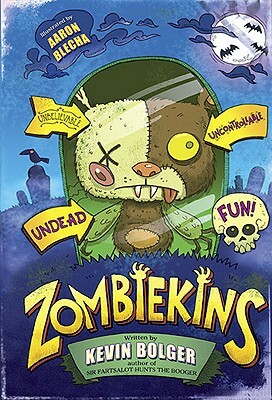 Stanley brings Zombiekins to school and unleashes the worst zombie plague in fourth grade history! Can Stanley find the courage to save the day before his teachers notice the class is full of zombies? Or will he soon join the ranks of the snuggily UNDEAD? Kevin Bolger teaches reading and writing to children from grades 2 to 6 in Ottawa, Canada. He spends every workday reading great kids books with actual kids, which naturally made him want to make one of his own. Books, that is. As a writer, he has published short humor pieces with McSweeney’s Internet Tendency and several Canadian dailies, and book reviews with the Toronto Star and The Globe & Mail.